Taking a break from the County Towns and the Parish Registers today with a beautiful and previously "unidentified location" in a Fergus O'Connor shot! A fine weir with a river in full flood to whet your appetite! Who's that sitting between the couple DannyM8? 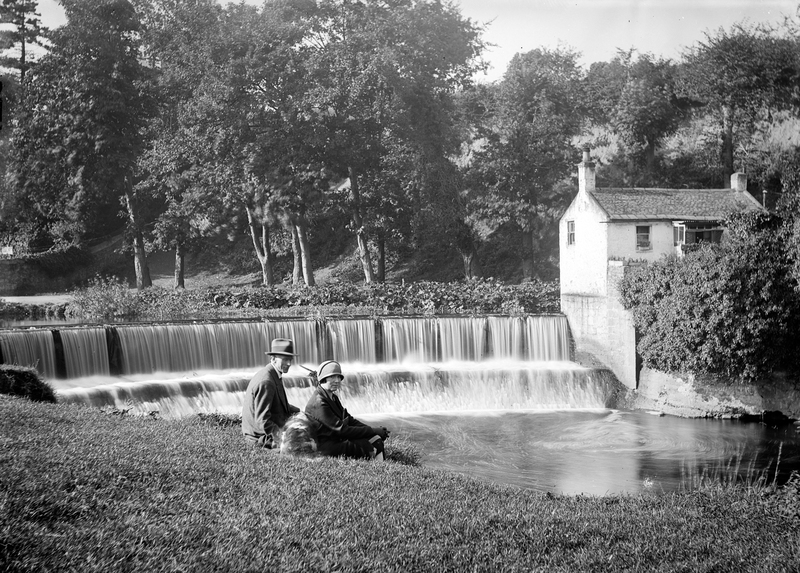 robinparkes Identified the location as the weir downstream from the bridge that takes the Orwell Road over the River Dodder. See his comment below which links to the relevant ordinance survey map. sharon.corbet confirmed Robin's observation. We have seen this weir before, see the link posted by DannyM8 below. Could it possibly be a Dog? yep a dog that shaking off the pond water. [https://www.flickr.com/photos/[email protected]] It's too similar for it not to be. I found a weir near Orwell Walk. goo.gl/maps/ESYnk Would that be it? [https://www.flickr.com/photos/[email protected]] Robin, I think it is more likely to be the one I linked rather than Orwell, but I am not 100% sure. [https://www.flickr.com/photos/[email protected]] It's the only one of that profile that I can find on the river and, as you said, it's just downstream from Orwell Bridge. [https://www.flickr.com/photos/[email protected]] Hi, Can you tell us a little more about the location? I lost a shoe in the river just above this weir when one of my older brothers swung me out over it, but that was not until around 1970, so the shoe is not visible here. [https://www.flickr.com/photos/gnmcauley] What a shame about your shoe, I will have a look for it next time I walk up there! a great image of the weir! Circa 1920s judging by the lady's hat.